Black rice is one of local rice varieties that have high secondary metabolite content with black and purple pigment. Its color indicated anthocyanin present as secondary metabolites that have some beneficial health on oxidative damage. Therefore, black rice potentially to be developed as functional foods. There are many kinds of black rice cultivars in Indonesia and this study is focused on 3 cultivars: Cempo Ireng from Sayegan, Toraja from Sulawesi, and Wajo Laka from Lampung. Generally, the grain is removed the husk by the process of grinding will be obtained brown rice, then second mockery of brown rice produced rice bran and endosperm. 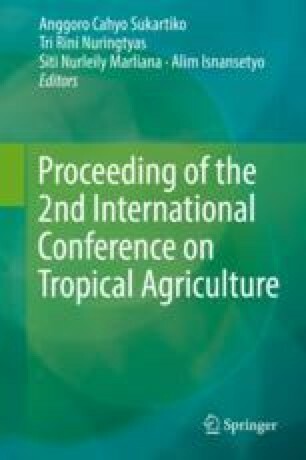 This study aims to determine total anthocyanin content (TAC) and antioxidant activity of brown rice, endosperm, and rice bran (Oryza sativa L.) of Cempo Ireng, Toraja and Wajo Laka cultivars. Measurement of TAC was conducted by pH differential method and antioxidant activity was measured by 2,2-diphenyl-1-picrylhydrazyl (DPPH) method with ascorbic acid as a possitive control. The TAC result was analyzed by SPSS 16.0 with two-way ANOVA with Duncan test and antioxidant activity was analyzed by MINITAB 14. The results showed that the highest of TAC and antioxidant activity of three black rice cultivars were consequently contained in brown rice, endosperm, and rice bran. For the conclusion, total anthocyanin content and antioxidant activity vary between black rice of Cempo Ireng, Toraja, and Wajo Laka cultivars. TAC was positively correlated with the antioxidant activity for three local cultivars of Indonesian black rice. This study was financially supported by BOPTN (Bantuan Operasional Perguruan Tinggi Negeri) Faculty of Biology, Universitas Gadjah Mada, Indonesia. We thank Rita Handayani and Dhaniar Pratiwi as part of Black Rice Research Team for the kind cooperation and Alifa Mubarok for her technical assistance. Sidiq FH. Data Pangan Kementan Berasan dari BPS. [Food data of Kementan Berasan from BPS]. 2017. http://rilis.id/data-pangan-kementan-berasal-dari-bps.html. Accessed 21 Mar 2018. [in Bahasa Indonesia].